One of the true joys of sharing this silly obsession with the great, wide world through the internet, is the discovery of like-minded individuals out there. 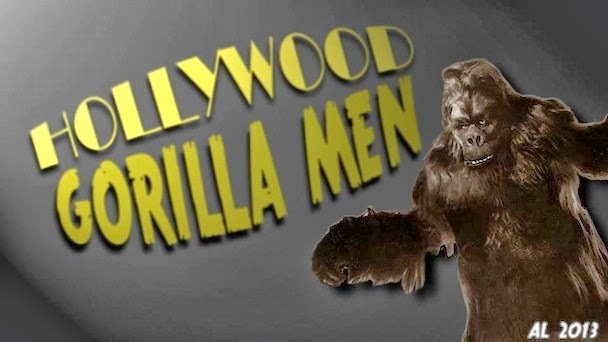 Enthusiasm for this curious aspect of popular culture I can understand - but in addition to exchanges with fellow film fanatics, my activities have flushed out a handful of unique men who wish to create a walking, thumping, snorting gorilla not unlike those of Gemora and Corrigan. 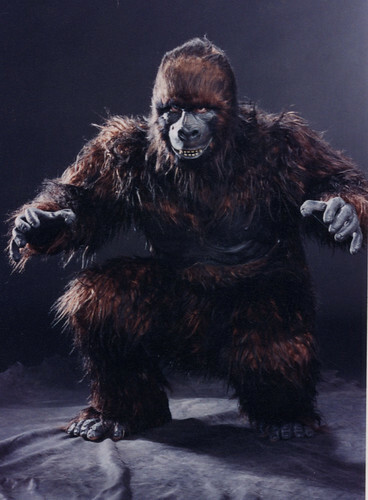 Actuators and CG may be the mode of choice for creating 21st century apes but this has not driven the traditional Gorilla Man into extinction. I have had the pleasure of chatting with Chris for a short while now and wanted to give readers a sample of what is possible with will and determination. 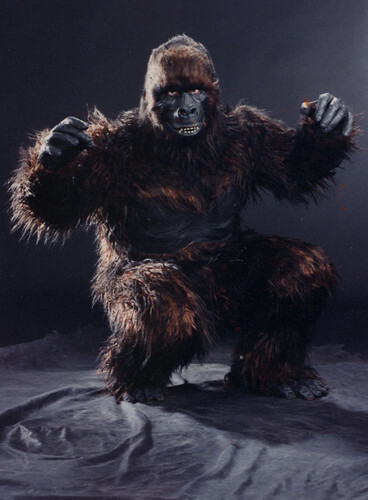 Chris built his original suit after becoming inspired by the exquisite craftsmanship and performances of modern Gorilla Man maestro, Rick Baker. Since his teens, Chris has spent a good deal of time loping about in a progression of suits constructed from both available and custom materials. 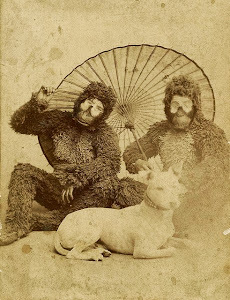 The bug must of bit deep, for although most classic gorilla men complained bitterly about the stress and taxing effort of performing in that damn ape suit, Chris made a career out of entertaining at parties, gatherings and seminar events. Now a little older and wiser, Chris is embarking upon a new effort to channel his inner beast. I have had the pleasure of seeing the beautiful sculpt for his resurrected alter ego ( now renamed Bongo) and Chris has promised to keep me updated as time allows him. I was going through my storage area and found some promo pictures of Gorga, my old suit. This is the altered version to make him more child friendly. 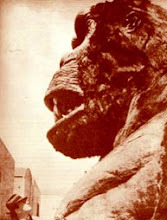 Gorga's original face was larger to accommodate the mouth mechanics and had a more fierce expression sculpted into his face, and the body was a bit more massive due to attached padding in the shoulders and chest. 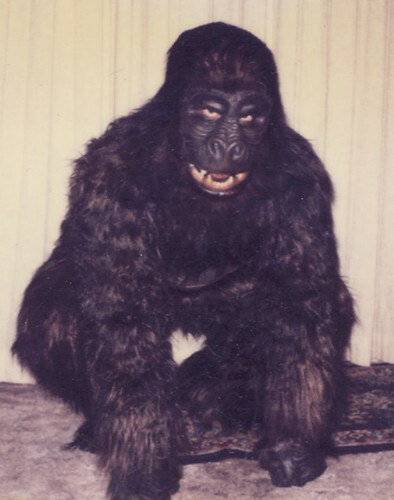 After we started using Gorga for kid shows I removed some of the padding and "tightened the fabric up to keep the suit snug and fitted," then I sculpted a new smaller face that I patterned after an old Don Post mask called (oddly enough) Hollywood Gorilla. I had always liked the look of that mask in Famous monsters magazine and thought it would be just the thing for Gorgas new role.But that was many years ago and now his time has passed, I'll miss the old fella. I sculpted the face, chest, and feet. The hands were made by Don Post Studios, they had the look I wanted so It was a time saver to buy rather than sculpt,mold,cast trim paint and hair them. Each rubber piece has a minimum of 5 steps to make, so if I can buy the piece and modify it to match the suit, it not only saves time, but sometimes money as well. This version of Gorga's face was cast with a fixed expression and had no mechanism. I sculpted it on a life-cast of my head with a almost prosthetic fit to the rubber mask. It fit so well that I could do minor movements by over acting with facial muscles, like scrunching up my nose and such. The bulk of the facial expression was done with my eyes and tilt of the head, if you tilt your head down and look up from under the brow with your eyes, it makes the gorilla look really pissed off ! But if you tilt your head back and lower your eyes slightly, the face will look almost as if it were smiling. The fur suit was sewn by me in a rust brown fur, then I tinted it into the blacker tones by misting black spray-paint onto the suit and brushing it through after it dried. Not 100% the color I wanted, but not too bad. (The photo above)... shows Gorgas original head, the pissed off one with the mouth mechanism, as you can see, this Gorga was considerably nastier looking than the previous photos I sent. 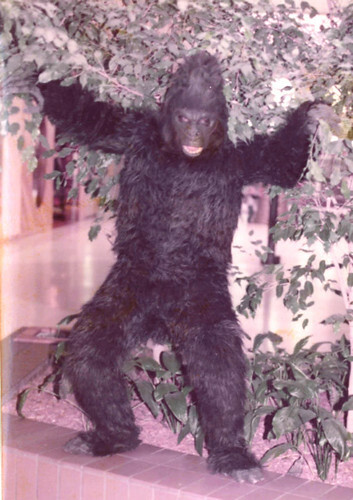 (The photo above)... shows my first suit I made, I sculpted his face to look like Rick Bakers "King Kong". It was an awesome suit, that really scared the crap out of people. It was also the first mechanism I had ever built. The mechanism worked OK., not great but OK. It would bare the teeth, but I couldn't open the mouth very far. It also took a heck of a lot of force to open the mouth, not bite force, but opening your jaw force. Unfortunately our jaws aren't built to work that way. 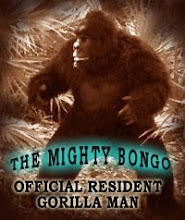 Stay tuned for the birth of a new ape in the months to come! Thanks again to Chris for sharing these wonderful pics.